Another photograph snapped while going by on the bus. 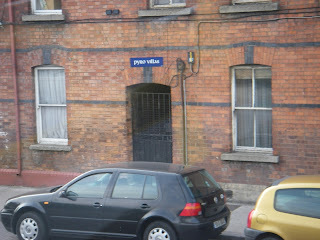 Dublin has some funny names for things. This one is right next to a totally roughneck neighborhood called Dolphin Barn. Seriously, Dolphin Barn. It's name conjures up images of Hawaiian hotels with children frolicking in swimming pools. In reality the place looks more like project housing from Chicago with lethal looking prison-fencing around the play yards. Other neighborhoods to avoid in Dublin are Tallaght (pronounced “tal-uh”), Deansrath and Foxdene. We drove past Foxdene in a cab the other day and voluminous black smoke was billowing out of the neighborhood. I pointed it out to the taxi driver and said, “Look, there must be a car on fire.” He replied, “Oh that. That's Foxdene. It's to be expected of that area. Lot of skangers and knackers there. They light the place on fire all the time.” Perhaps there is a Pyro Villas in Foxdene as well? My father was born in Pyro Villas. Did you enter the gate? No I was riding by on the bus.